Our full-service grooming salon offers a wide range of salon services from nail trimming to tooth brushing to complete haircuts. 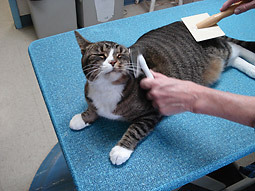 Our professional groomer is certified for all dog and cat breeds. Medicated baths, conditioners and cream rinses are available to make your pet’s coat healthier and more beautiful. We use the HydroSurge animal bathing system. Your pet will love the relaxing massage from the HydroSurge handheld massage sprayer, which allows the warm bathing solution to penetrate their coat for a thorough cleaning. The invigorating whirlpool jet action helps remove loose hair, dry, flaking or dead skin, and other debris for the healthiest skin possible. The HydroSurge greatly enhances the effectiveness of any medicated shampoos or other coat and skin treatments. For chronic skin problems, regularly scheduled HydroSurge therapeutic baths are recommended. To schedule a grooming session for your pet, please call our office or fill out the request form below. We will be in touch with you to set up an appointment as soon as possible.